Leonard Simon Nimoy (March 26, 1931 – February 27, 2015) was an American actor, movie director, poet, musician and photographer. He was famous for playing the character of Spock on Star Trek, an American television series that was made for three years in the late 1960s. Nimoy was born and raised in Boston, Massachusetts. His parents were immigrants from Ukraine. They were Dora Spinner and Max Nimoy. He took acting classes at Boston College and the Pasadena Playhouse. Nimoy began his career in his early twenties, teaching acting classes in Hollywood and making minor movie and television appearances through the 1950s, as well as playing the title role in Kid Monk Baroni. In 1965, he made his first appearance in the rejected Star Trek pilot "The Cage", and went on to play the character of Spock until 1969. He followed his role of Spock by eight feature movie and guest slots in the various spin-off series. The character has had a significant cultural impact and earned Nimoy three Emmy Award nominations; TV Guide named Spock one of the 50 greatest TV characters. After the original Star Trek series, Nimoy starred in Mission: Impossible for two seasons, hosted the documentary series In Search of..., narrated Civilization IV, and made several well-received stage appearances. He also had a recurring role in the science fiction series Fringe. Nimoy's fame as Spock was such that both of his autobiographies, I Am Not Spock (1975) and I Am Spock (1995), were written from the viewpoint of sharing his existence with the character. Nimoy has a star on the Hollywood Walk of Fame. In 2011, Nimoy voiced the main villain, Sentinel Prime, in Transformers: Dark of the Moon. In 2009 and in 2013, Nimoy played Spock Prime in the J. J. Abrams Star Trek movies: Star Trek and Star Trek Into Darkness. Nimoy was married twice. In 1954, he married actress Sandra Zober (1927–2011), whom he divorced in 1987. On New Year's Day of 1989, he married actress Susan Bay, cousin of director Michael Bay. Nimoy had a daughter and son by his first wife. 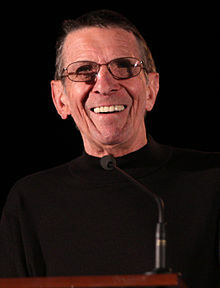 Shortly after he was photographed in a wheelchair and using an oxygen mask, Nimoy said in February 2014 that he had been diagnosed with chronic obstructive pulmonary disease (COPD). Little over a year later, Nimoy died from the disease on February 27, 2015 at the age of 83 in his Bel Air home. Nimoy was laid to rest in a private service in Los Angeles on March 1, 2015 at the Hillside Memorial Park Cemetery in Culver City, California. He was buried on a Sunday since Jewish tradition does not allow such services on a Saturday. ↑ 2.0 2.1 Heffernan, Virginia (February 27, 2015). "Leonard Nimoy, Spock of 'Star Trek,' Dies at 83". New York Times. Retrieved February 27, 2015. ↑ "Nimoy glad to be back with 'Fringe'". New York: News World Communications. United Press International. May 12, 2012. Retrieved November 1, 2013. ↑ Steve Chawkins. "Leonard Nimoy dies at 83; 'Star Trek's' Mr. Spock". Los Angeles Times. Event occurs at 2015-2-27. ↑ "Leonard Nimoy: Biography". TVGuide.com. San Francisco, California: CBS Interactive. Retrieved February 3, 2009. ↑ Jensen, K. Thor (November 20, 2008). "Spock". UGO.com. San Francisco, CA: IGN Entertainment, Inc. Retrieved February 3, 2009. ↑ "BBC News - Leonard Nimoy reveals he has lung disease". BBC News. London. 6 February 2014. Retrieved 6 February 2014. ↑ "Leonard Nimoy's funeral held in LA". BBC News. March 2, 2015. Retrieved March 2, 2015. Wikimedia Commons has media related to Leonard Nimoy.